In other seed tubes, the sensor can interfere sending the seed into gyrations that slow it causing gaps and misplaced seeds. 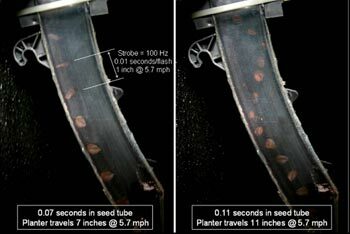 The BullsEye Seed Tube moves the sensor eye behind a ledge that makes it impossible for the seed to nick the sensor. It is a straight shot to the trench. To extend wear life, we’ve imbedded tungsten carbide into the bottom of the tube. This eliminates the wear that causes the small poly dog-ear that normally appears on the left side of the tube. The tungsten keeps the double disk opener from wearing against the side of the tube.